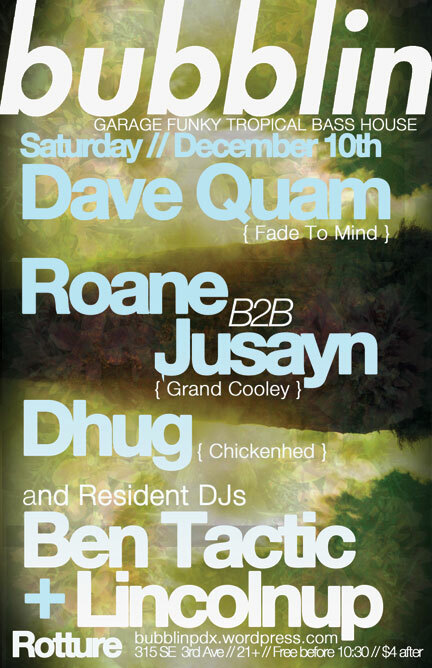 For Bubblin XXI we welcome distinguished and esteemed PDX selectors Dave Quam, Roane, Jusayn, and Dhug into the mix. Dave Quam is a writer, photographer, producer, and DJ whose work has appeared in XLR8R, The Wire, DJ Magazine, and Shook to name a few. His blog, It’s After the End of the World, is one of the seminal portals into the kaleidoscopic regional/global bass sounds of yesterday and today. He’s recently relocated back to his hometown of Portland from Chicago, where he extensively documented and participated in the Windy City’s vibrant Juke/Footwork scene – the latest sounds out of Chicago that are currently reverberating on dancefloors round the world. His crates are as deep and varied as any to be found in the global bass continuum. We’re stoked to have him come though and light up the Bubblin set! Roane and Jusayn both rep Portland’s eclectic, freewheeling collective Grand Cooley with commendable aplomb. After witnessing their excellent and rousing B2B set at a wild house party late this past summer, they went onto our short list of locals to put on. Vinyl purists both, their crates are stocked with irreproachable house and boogie tracks plus a shockingly deep selection of super choice freestyle cuts. Trust these fellows are gonna nice up the dance properly! Dhug, of the madcap Chickenhed crew, first heard Moombahton at Dave Nada’s rowdy December 2010 PDX debut at Bubblin and was fully smitten by the sound. A year later, we’re pumped to have him coming through to lace us with a smoothed out moombah set to get Bubblin XXI started. This entry was posted on November 18, 2011 at 11:24 am and is filed under Uncategorized. You can follow any responses to this entry through the RSS 2.0 feed. You can leave a response, or trackback from your own site.